Do you feel that your life choices don’t fit together? Do you ever ask, “Is this all there is?” Do you want more health, joy, peace, love, or abundance in your life? Do you wish you could help loved ones through their challenges in a deep, meaningful way? Do you want that kind of help for yourself? Are you moved to do something else, but don’t know what it is? Do you feel there is something more or bigger for you to do? Do you wish YOU had “the gift” that would let you hear messages from the Angels and Guides, connect with past lives, or see the future? 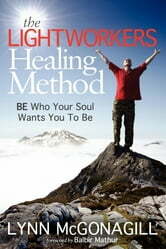 Welcome to the Lightworkers Healing Method. LHM is both a spiritual growth vehicle and a healing system with an exceptional goal: to align us with our soul’s life purpose. It improves the present by working with both past and future lives as well as higher-dimension Guides, Angels, and Lightbeings in a unique and powerful process. LHM applies to any arena of life: physical, mental, emotional, spiritual, financial, or interpersonal. Nothing is off limits. In this method of Divine energy healing we learn to become conduits for Divine energy to help ourselves and others meet life’s challenges and succeed. "BE Who Your Soul Wants You To Be" is a how-to manual for this unique system of spiritually guided energy healing. Channeling Divine healing is not a gift; it is a teachable, learnable skill. Now it can be your skill. BE who your soul came here to be; live the life you came here to live. Help others do the same. As we each do our part, the world transforms. Come join us in the transformation. BEING Your Self: Seeing and Knowing What's IN the Way IS the Way!